Virtual network switches use NAT configured by iptables rules. Editing these rules while the switch is running is not recommended, as incorrect rules may result in the switch being unable to communicate. IP information can be assigned to guests via DHCP. A pool of addresses can be assigned to a virtual network switch for this purpose. Libvirt uses the dnsmasq program for this. 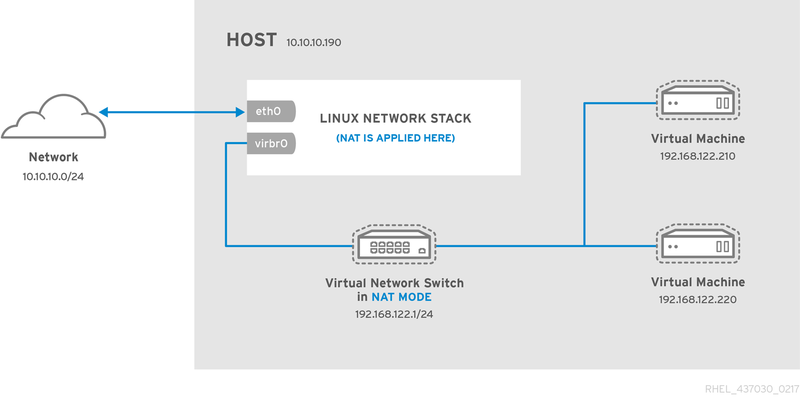 An instance of dnsmasq is automatically configured and started by libvirt for each virtual network switch that needs it.